I’ve had the pleasure of getting to know Mike Damphousse, a co-founder and partner at Category Design Advisors and longtime member of the Play Bigger family. I’ve learned a lot from him about sales, marketing and the discipline of category design as we work to introduce the concept to Canadian founders and venture capitalists. His latest blog article provides a fascinating look at one of the greatest category designers in history – Jeff Bezos. Mike looks at Amazon’s pattern of not just innovating, but the “flywheel effect” that comes from continually redefining categories and expanding the company’s dominance into new markets. 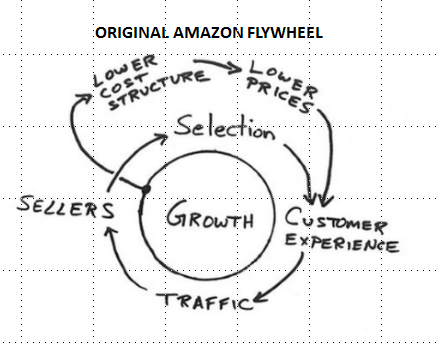 From an online bookstore in 1995 to their recent acquisition of Whole Foods, Mike takes us through some of Amazon’s biggest flywheel plays. Read the whole article on the Category Design Advisors’ blog: Amazon’s Flywheel Momentum Continues to Dominate Categories.